NASHVILLE. Feb. 27, 2018 /Christian Newswire/ -- Christian media group SAT-7 (www.sat7usa.org) is marking a major milestone at "Proclaim 18," the 75th annual National Religious Broadcasters (NRB) Convention—a decade of children's broadcasting in the Middle East and North Africa, where churches may be outlawed and sharing the gospel openly is widely restricted. Photo: SAT-7 KIDS is marking 10 years of impacting the spiritual lives of millions of children in the Middle East and North Africa, through Christian programming that reaches homes in places where sharing the gospel openly is often restricted. 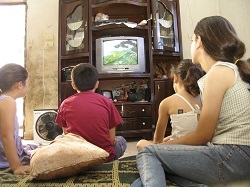 Over the past 10 years, SAT-7 KIDS has built up a regular viewership of more than 4.5 million across the region, sharing Christ's love and promoting peace through a wide range of Arabic language programming aiming to present the good news, strengthen the church and prevent radicalization. Viewers tune in from every country, with the largest audience in Egypt, then Syria, Morocco and Yemen. The impact can be traced through the feedback of viewers like the mother of two young boys in Iraq. "Through your programs, they learned to read a Bible story with me every night before going to bed," she said. Parents from non-Christian backgrounds regularly thank the network for its positive children's programming. With studios in Cyprus, Lebanon, and Egypt, SAT-7 KIDS presents the good news 24/7 through dramas, talk shows, cartoons, quiz and talent shows, music videos, live call-ins and worship programs. In addition, the network offers a daily on-air complimentary school (Arabic, English, mathematics, science) to help some of the region's many displaced young refugee viewers keep up with their education. "It's a blessing that we have been able to impact children's spiritual lives, helping them to know God's love, understand his word, pray for his peace, and seek his forgiveness," says SAT-7 Chief Channels Officer and Deputy CEO, Rita El Mounayer. "Many of these children now have an unfailing hope in God with which to face their futures, and are equipped to change the face of the Middle East, applying what they have learned from our screen and sharing it with their families, neighbors and friends." Children's programming has been an important part of SAT-7's broadcasts since its launch in 1996. But with almost a third of those living in the region estimated to be aged 14 or younger, leaders wanted to focus more attention on the next generation. SAT-7 KIDS debuted in December 2007, and reaches seven time zones, from Morocco to Afghanistan. In the years since, countless viewers have grown up with the channel. Marianne Awaraji Daou, a former child actor with SAT-7 KIDS, later went on to present several seasons of the live show Let's Sing Together and now hosts a marriage counseling program, From Heart to Heart, with her husband, Rawad Daou. Launched in 1996, with its international headquarters in Cyprus, SAT-7 (www.sat7usa.org) broadcasts Christian satellite television to an audience of over 21 million people in the Middle East and North Africa. SAT-7 broadcasts in Arabic, Farsi and Turkish on five channels.